Marketers have spent almost their entire budget chasing new prospects. Years ago, when sales staffs were large and competition well-known, the answer was easy. Turn leads over to Sales and let them do their jobs. Today, lean sales departments have bumped into tight marketing budgets and the constant search for ROI has moved the prime target from prospects to customers. Advancements in technology have played a large role. It is only in the last five to six years that most marketers have been able to affordable approach prospects with the kind of personal attention approaching that offered by professional salespeople. 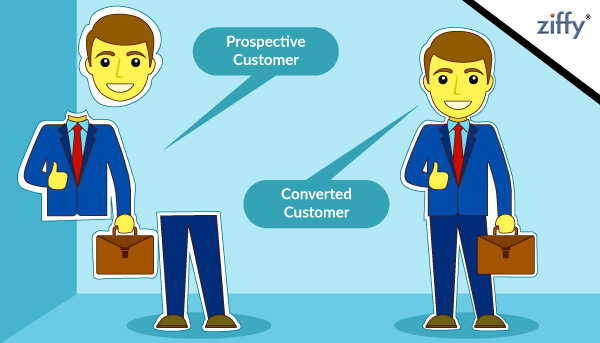 There are many reasons why your prospect’s don’t convert into Customers some of them are as follows. The most important thing in any sales process is to engage your Customers and if you are not able to do it it’s your Biggest drawback. To progress through the marketing funnel, prospects need a reason to move. Since at this stage prospects are still not ready to make a large commitment, tools that service their informational needs tend to work best. Getting prospects to declare what they are really looking for will help you serve them with more meaningful communications. If you are not Socially active this will also be a negative point you should always be in touch of your Customers. You can wow customers with content, woo them by demonstrating how much you care, or whisk them away with an anti-social stance. Prospects expect your company to express interest in them with ongoing interaction via social media. If your site is rich with resources, it’s risky to ask visitors to scour through the pages to find what they seek. Put a simple search field on your homepage and use content filters where they’ll help speed access to the content prospects might want. Understand the segments and persona you serve and place obvious signposts where they will help direct traffic. What’s more, allow visitors to qualify themselves so specific segments of your potential customer base can be addressed more personally and as pragmatically as possible. If you don’t follow up your Customers properly then your prospects will never convert into Customers. In today’s dynamic marketplace, businesses are constantly developing new and innovative ways to serve their customers and attract prospects. It has become crucial to continuously be in touch with your current and prospective customers to build strong and trusting relationships with them. Here are some reasons why your Prospects does not Convert into your Customers.You should always keep this thing in mind before you focus on other things.